In CMAT 2019 “Logical Reasoning” section will have 25 questions comprising of 100 marks. Through conceptual development, a student can focus on developing a strong theoretical background in each of the sections of the exam. Focus on shifting your normal areas to being strong. Shifting your weak areas to being normal and strengthening your strengths!!! An important thing you should realise while preparing is that when you are taking the CMAT, the entire potential of your brain will not be available to you. Your mind will be in such a state that you might be forced to even check 2+2. So remember, the basic principle is that if in your normal day to day preparation, you can do something by using an excess of 80 to 90 per cent of your mind’s capacity, you would not be able to execute that thinking in the CMAT paper. What you need to realize is that unless you train yourself to be able to execute your thought processes under intense unrelenting pressure, any preparation for the CMAT, by and large, makes no sense. What you need to realize is that solving a question in a tranquil study room is very different from the experience of solving a question inside the pressure-cooker atmosphere of CMAT - a variable that is only likely to become more in the context of a computer based examination. So 'handling pressure' is one of the most crucial variables that you need to factor in while preparing for CMAT. Obviously, the most important question remains, "How can I handle pressure well?" The CMAT paper is designed keeping in mind a lot of factors that coaching classes cannot even consider while designing their mock test papers. 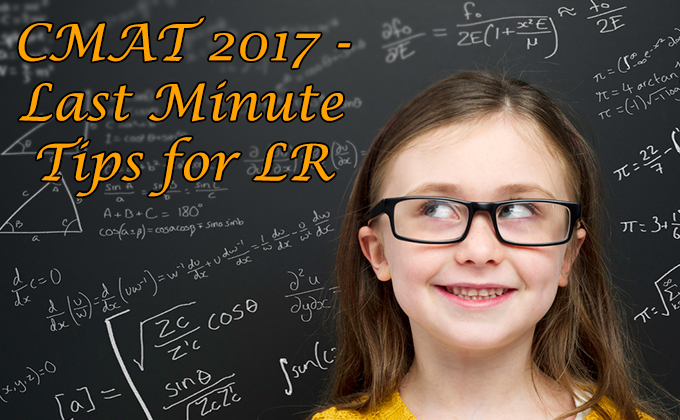 For instance, no question asked in the data interpretation (DI) and logical reasoning (LR) section of the CMAT requires more than six to eight steps for solving. However, some questions in the mock papers require as long as 20 steps to be solved. The middle letters are static, so concentrate on the first and third letters. The series involves an alphabetical order with a reversal of the letters. The first letters are in alphabetical order: F, G, H, I , J. The second and fourth segments are reversals of the first and third segments. The missing segment begins with a new letter. Statements: All bags are cakes. All lamps are cakes. I. Some lamps are bags. II. No lamp is bag. Since the middle term 'cakes' is not distributed even once in the premises, no definite conclusion follows. However, I and II involve only the extreme terms and form a complementary pair. So, either I or II follows. Statements: Some dogs are rats. All rats are trees. Some trees are not dogs. I. Some trees are dogs. II. All dogs are trees. III. All rats are dogs. IV. No tree is dog. Some dogs are rats. All rats are trees. Since one premise is particular, the conclusion must be particular and should not contain the middle term. So, it follows that 'Some dogs are trees'. I is the converse of this conclusion and so it holds. All rats are trees. Some trees are not dogs. Since the middle term 'trees' is not distributed even once in the premises, no definite conclusion follows.